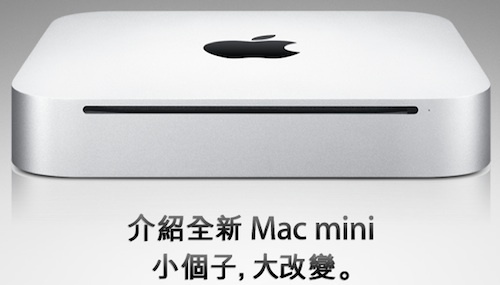 AFP reports that Apple has agreed to honor pricing on as many as 40,000+ Mac mini orders that had been erroneously priced at only about 40% of their actual retail prices. The announcement comes after Apple had quietly raised the prices to their normal levels for orders that had already been placed at the incorrect prices and after Taiwanese officials applied pressure on the company to honor the prices. The error occurred last Friday when the company accidentally discounted a desktop computer and a server on the Education Apple Store's Taiwan website, with one on sale for a little over 40 percent of what it should have been. Apple corrected the prices but not before over 41,500 units had been ordered by bargain-hunters, according to figures provided by the company to Taipei's consumer protection authorities. Previous reports had indicated that as many as 200,000 orders may have been placed at the lower pricing, but this latest report places the figure much lower than that. In addition, the new report adds the detail that the pricing error occurred only in Apple's online store for educational purchasers in that country, and that Apple will be verifying eligibility for all customers who ordered at the lower price. Consequently, the actual number of orders Apple will have to fill at the discounted price may be considerably lower, as many non-eligible customers may have submitted orders in hopes of slipping past Apple's verification checks.